Amazon Web Services (AWS) and taking advantage of the massive compute power of Amazon Elastic Compute Cloud (Amazon EC2). 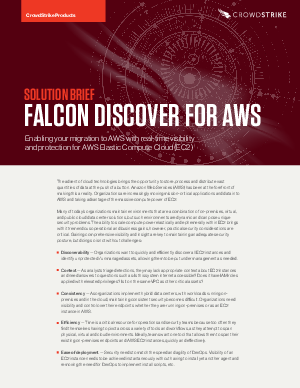 The CrowdStrike Falcon® platform for AWS provides extensive and detailed visibility over Amazon EC2 instances, helping to improve an organization’s overall security posture. Learn how CrowdStrike® Falcon Discover™ enables IT security professionals to quickly identify and stop threats.